The Doctor is a LEGO Ideas minifigure released in 2015. The Eleventh Doctor is based on his outfit from Series 5 and 6, and the first half of series 7. The minifigure has a brown hairpiece which was first used on Anakin Skywalker. The head of the minifigure is a light nougat colour with defined cheekbones and a smiling expression. It has a beige tweed jacket with a pink-striped undershirt and a red bow tie near the top of the torso. The pants are brown color, with a continuation of the jacket. The minifigure has a fez as an accessory. The Time of the Doctor variant has the same gray hairpiece as the Series 8 variant. The figure has a purple coat with a dark blue and lighter blue shirts underneath. A yellow medal is also depicted on the torso. The legs of the minifigure are black, with a continuation of the coat onto the legs. The Twelfth Doctor's accessory is a Sonic screwdriver, based on the variant used by the 11th Doctor. This outfit was primarily used for the Eleventh Doctor for the second half of Series 7, although the Twelfth Doctor briefly wore it post his regeneration in Time of the Doctor at the start of Deep Breath. The Series 8 variant has a new grey hairpiece, used also for Peter Venkman. The minifigure dons a navy blue jacket that extends to his legs, with a white collared shirt and the red interior of the jacket visible. The legs are plain navy blue with the aforementioned printing of the jacket halfway down the legs. 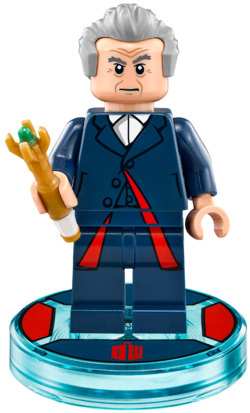 A Sonic screwdriver is provided for the minifigure, based on the Eleventh Doctor's design. The Doctor is a Time Lord from the planet Gallifrey who stole a TARDIS (a machine that can travel through time and space) to explore the universe. However, the Doctor often ran into trouble, and despite his people's non-interference policy, the Doctor often acted against evil in a nonviolent manner and tried to protect those who needed assistance. In many instances, before he dies, he goes through regeneration, a Time Lord ability which changes his personality and his genetic makeup and allows him to survive near-death experiences. To date, there have been thirteen different unique incarnations of the Doctor. However, for one incarnation during an event known as the Time War, he forwent going by the name of the Doctor. His current companion is Clara Oswald. His enemies are fellow Time-Lord The Master, Daleks, Cybermen, Silence, Weeping Angels, and Autos. The Twelfth Doctor is voiced by Peter Capaldi in LEGO Dimensions, who also plays the Twelfth Doctor in Doctor Who. This page was last edited on 7 July 2016, at 16:44.